Virginia wineries continue to gain national and international recognition. 10 of them recently won awards at the 2012 San Francisco International Wine Competition. The competition, held in June 2012, is the largest international wine competition in America, with more than 4,500 wines from 26 U.S. States and 29 countries competing. In that context, Frank Morgan and David White, recently organized a blind taste-off: Virginia versus the World. Vendredi du Vin #54 : Soyons Joueurs! This posting is being published as part of the Vendredis du Vin, a monthly blog event in France. Participating wine bloggers - mainly in France - are all releasing postings today under the same heading. This month's Vendredi du Vin is orchestrated by Anne Graindorge, recent winner of the Wine Blog Trophy de Loire. The theme is "soyons joueurs!" - "Let us Gamble", on blind tasting. Virginia is the 5th largest wine industry in the US, with more than 200 wineries and 2,500 acres of vineyards. Finally, Claude Thibault, a native from France, has taken Virginia sparkling wines to a new level. His NV Thibault-Janisson Brut, made from 100 percent Chardonnay, which President Obama offered his guests at his first state dinner, is as close as you can get to Champagne outside of France. Hosted by the Washington Wine Academy, the theme was to pit Virginia Chardonnays and Bordeaux blends against similar, comparatively-priced wines from other regions in the world. We tried to stick to the $18-$35 price range for Chardonnays and $25-$55 for the red blends. While we managed to have all white wines from the 2010 vintage, for the red wines we ended up with wines from2006 to 2009. The wines were all brown-bagged and tasted blind. 100% Chardonnay, 100% barrel fermented with 29% undergoing malolactic fermentation, aged for 9 months in medium-toast French oak barrels, alcohol 13.5%. 100% Chardonnay, fermented in oak barrels with inoculated yeasts, 50% underwent malolactic fermentation, aged for nine months in barrel where it underwent regular batonnage. Light yellow in the glass, notes of honeysuckle, green pears and citrus peel on the nose, a bit bitter on the palate, good finish. 100% Chardonnay, fermented in new and used barrels with cultured and indigenous yeasts, some barrels underwent malolactic fermentation, aged for 10 months on the lees with batonnage, alcohol 14.2%. Medium gold yellow in the glass, notes of honeysuckle, vanilla on the nose, a rich wine, round on the palate, lovely finish. Light straw yellow in the glass, notes citrus, lemon, honeysuckle on the nose, a crisp and fresh wine, notes of green apple and pear fruit on the palate, long mineral-laden finish. 100% Chardonnay, in barrels (83%) and stainless steel tanks (17%) of which 55% underwent malolactic fermentation, aged for 8 months on the lees in 29% new French oak, alcohol 13.5%. Light yellow in the glass, notes of vanilla and caramel on the nose, a full-bodied wine, notes of ripe pear and melon on the palate, short finish. 100% Chardonnay sourced from vines 40-65 years of age, alcohol 13.5%. Light yellow gold in the glass, beautiful, sweet notes of apricots, lychees on the nose, fresh and crisp on the palate, good texture. 100% Chardonnay sourced from vines at 1,830 feet, fermented in stainless steel then aged in barrels, alcohol 13.2%. Light straw yellow in the glass, notes of spices and vanilla on the nose, lively acidity on the palate, followed by some toast, and spice. 80% Merlot and 20% Cabernet Sauvignon sourced from 28-year-old vines, fruit was destemmed and fermented in temperature controlled wooden vats for 25-30 days, underwent malolactic fermentation then was aged on the lees in up to 80% new oak barrels for 15-20 months, alcohol 14.5%. Chateau d'Aiguilhe is one of the wineries of Count Stefan von Neipperg. The von Neipperg portfolio also includes Chateau Canon La Gaffeliere and La Mondotte, 2 of 4 estates promoted to Premier Grand Cru Classés B last year. Medium cherry in the glass, rich notes of sweet plums, red licorice on the nose, a yummy wine, notes of ripe fruit and chewy tannins on the palate, long finish. Cabernet Franc, Merlot, and Malbec, alcohol 13.8%. Medium garnet in the glass, notes of cassis, leather, wet dirt on the nose, nice mouthfeel, soft tannins and creamy blackberry fruit on the palate, good finish with a hint of tobacco. Interestingly, the von Neipperg and the Boxwood wines are "made" by the same winemaker,Stephane Derenoncourt, who consults at both wineries. 62% Merlot, 29% Cabernet Sauvignon, 6% Cabernet Franc, and 3% Petit Verdot. Medium to dark cherry garnet in the glass, rich notes of sweet roses, toasted oak, dark cherries on the nose, good mouthfeel, spicy tannins, flavors of cranberry sauce and blackberry jam on the palate, impressive depth, too young. Merlot, Cabernet Franc, Cabernet Sauvignon, and Petit Verdot, fermented in stainless steel tanks, macerated for 10-20 days, aged 12-14 months in new Gamba barriques, alcohol 13.5%. Light to medium cherry in the glass, notes of cassis, smoke and rhubarb on the nose, a medium-bodied wine with tangy acid and bright tannins on the palate, good finish. 63% Cabernet Sauvignon, 25% Cabernet Franc and 12% Petit Verdot, alcohol 13.9%. Medium garnet in the glass, notes of candied cherries, spices on the nose, a medium-bodied wine with notes rhubarb and again spices on the palate, soft finish with some tannins. 33% Cabernet Sauvignon, 30% Merlot, 17% Cabernet Franc, 14% Malbec, and 6% Petit Verdot, aged for 22 months in French and American oak, alcohol 14.5%. Medium cherry in the glass, notes of fig, loam, leather on the nose, a fruity wine with notes of green pepper and wet earth on the palate, nice finish with a hint of vanilla. 70% Cabernet Sauvignon and 30% Merlot, aged for 12 months in 20% new barriques, alcohol 13%. The second wine of Chateau Brane-Cantenac, a Deuxieme Grand Cru Classe en 1855. Medium garnet in the glass, appealing on the nose, with ripe dark fruits and some oak, a medium- to full bodied wine, good acidity, cherries on the palate with a gentle layer of ripe tannins, long finish. Isaac James Baker (Reading and Writing, Wine), Frank Morgan (Drink What You Like) and Aaron Nix-Gomez (Hogshead Wine) have already posted about the event on their blog. In recent years, I have tasted Syrah/Shiraz with winemakers around the world. In this posting, I am recalling a number of these tastings, with winemakers from Châteauneuf-du-Pape, South Africa, Paso Robles, Berkeley, Austria, Washington State, Oregon and Australia (in no particular order). This posting is being published as part of the Weinrallye, a monthly blog event in Germany. Participating wine bloggers - mainly in Germany - are all releasing postings today under the heading " Syrah/Shiraz – a Global Player”. Weinrallye is the brainchild of Thomas Lippert, a winemaker and wine blogger based in Heidelberg, Germany. This month's wine rally is organized by Susanne Werth-Rosarius (hunderachtziggrad). Syrah/Shiraz is a dark-skinned grape grown all around the world that tends to produce a powerfully flavored, full-bodied wine, with a peppery and sometimes lusty taste. Syrah has a long tradition in the Rhone region in the South of France. In Australia, it became popular under the name Shiraz, where it now has long been established as the most grown red grape variety. Some sources suggest that the grape variety originates in the city of Shiraz in Iran, from where it was brought to France and there named Syrah. In the US, it is mostly called Syrah, but should not be confused with Petite Syrah, which is a different grape variety. The wines that made Syrah famous were those from Hermitage in the northern Rhone valley, in the 18th and 19th century. Syrah arrived in Australia in the early 19th century and was first planted in Hunter Valley. By the end of the century, Syrah was fully established as one of Australia’s grape varieties. Pinfold’s Grange is the most famous Shiraz from Australia, although it is not 100 percent Shiraz, but a blend. 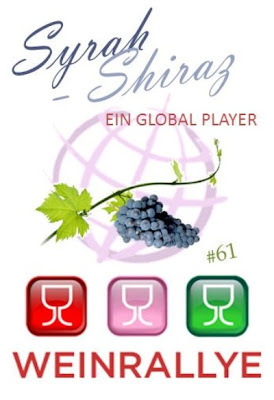 In the last few decades, Shiraz/ Syrah has enjoyed increased popularity, both in the Old and New World and recently broke into the top 10 of varieties planted worldwide. Domaine La Bastide Saint Dominique is a family-owned winery in Courthézon in the southern part of the Rhône Valley in France. Eric Bonnet: “My family has been making wine for a number of years now. My great-grandfather started it. He did not bottle the wine he made under his own label, but sold it by barrel to a negociant. My father started to bottle the wine in 1980.” The family owns 38 hectares of vineyards in the Châteauneuf-du-Pape AOC and other areas. Tasting notes: 2004 - Deep ruby in the glass, notes of plum, meat, and spices on the nose, solid acid/tannin backbone on the palate, full-bodied and mouth-filling, more open, more approachable than the 2005. 2005 - Deep ruby in the glass, notes of blackcurrant, gunflint and tobacco on the nose, a bigger nose than the 2004, full-bodied with good acidity and sweet tannin, still a bit closed on the palate. Hermitage is typically at its best between 10 and 20 years after the vintage, but the greatest examples from the strongest years can go on for several decades. This one should be put aside for many years. From an initial 6000 bottles in 1996, now Boekenhoutskloof’s output is running at 3 million bottles, of which 95% is its second label Porcupine Ridge and the new Wolftrap, and 5% the premium category wines Boekenhoutskloof and The Chocolate Block. Founded in 1776, Boekenhoutskloof is one of the oldest farms in the Franschhoek Valley and has seen a phenomenal development since 1996. It now enjoys a reputation as one of the leading wine estates in South Africa. Tasting notes: Rich dark berry, black plum, pepper and coffee and mocha on the nose. The palate is rich with plenty of complexity and hints of blackberry, dried cherry, prune, and cranberry. Thacher Vineyards is in the Paso Robles American Viticulture Area, which is located midway between San Francisco and Los Angeles on California’s central coast. More than 26,000 acres are planted to vineyards that provide fruit for Paso Robles wineries and others throughout the state. Today there are more than 170 wineries. Tasting notes of Sherman Thacher: This wine is clear and bright, with a deeply intense shiny purple core, fading to a medium purple rim. Legs are slow and sheeting, with saturated purple color. On the nose, this wine is clean and developing, with medium plus intense aromas of ripe black cherries, French roast coffee beans, vanilla, cedar, plum sauce, cocoa nibs, tar and cola. On the palate this wine is dry, with medium plus firm tannin, medium plus spicy alcohol, medium plus filling body, and medium acid. Flavors are medium plus intense, and include ripe black cherries, vanilla extract, cedar, roasted coffee, black huckleberries, cola, cinnamon and Chinese five-spice. The finish is very long and supported. Firm tannins carry throughout, with dense chocolate and black fruit flavors. Acid to balance. Outstanding. This wine is ready to drink, but has enough structure, depth and complexity of elements to last 5-7 more years. The Donkey and Goat Winery is a wife and husband owned and operated winery located in Berkeley, California, producing “natural” wines. Tracey and Jared Brandt are the "donkey and goat" behind these naturally made wines. Tracey and Jared just make the wine, they do not own vineyards. The wine they make is very special: Tracey and Jared are followers of the natural wine movement. It is a rather new winery, established in 2004. Jared: It was the first year we made this wine in our Rousseau 4t wooden open top vat. We do not make wine in plastic. Never have and never will. All of our reds are fermented in open top wood vats. The wines like Fenaughty, that go into the 4t vat, benefit from less temperature extremes and longer mid-range temps (in the high 70’s to low 80’s). Like all of our red wines, we only use the machine for whatever level of de-stemming is desired. In this case only we de-stemmed 75% leaving the rest whole cluster. The Fenaughty vineyard also has Viognier planted so we picked a few hundred pounds with the Syrah to result in approximately 3.5% co-fermented Viognier in our final blend. Crushing is achieved via pigeage à pied (foot stomping) and in our Rousseau vat, our stompers must channel their inner Lucy to get the job done. Wild yeasts are employed without nutrients or other enhancers. We punch down by hand up to 3 times daily which is an extreme work out in a 4 ton tank with 25% whole cluster! The cooperage was a mix of 1-3 yr old French oak barrels. Malolactic fermentation was natural and completed by early summer. The wine stayed sur lie for 8 months when it was racked and returned to barrel for the final 12.5 months of aging until the final blend was assembled in early June 2009. The wine was bottled without fining or filtration on July 14, 2009. Jared’s tasting notes: Tobacco, earth and herbs intermingled with violets grab your olfactory immediately. With a moment to breathe, mineral, fresh meat and spice box come to the fore. Red fruits like cherry, plum and raspberry tickle the palate. Long, firmly structured yet smooth tannins coat the mouth and linger for minutes while you ponder what this wine is and what it will become. Pictures: Christian G.E. Schiller with Jared Brandt from the Donkey and Goat Winery in Berkeley, California. Donkey and Goat Produces in the Middle of Berkeley Natural Wines, where I recently spent a couple of hours with Jared talking about what natural wines is all about. The Netzl Estate is located in the small town of Göttlesbrunn in the Carnuntum. The family has been involved in wine production since 1820. Franz and Christine Netzl are regarded as one of those responsible for the red wine boom in this region. Hightower Cellars is a small winery in the Red Mountain area of Washington State, owned and managed by the charming husband and wife team Tim and Kelly Hightower. Hightower Cellars is about 200 miles away from Seattle, on the way from Seattle to Walla Walla. The vineyards the Hightowers own are all in the Red Mountain AVA - the land surrounding the Red Mountain – between Benton City and Richland. It is part of the Yakima Valley AVA, which in turn is part of the larger Columbia Valley AVA. The Red Mountain AVA is a small AVA with 600 acres under cultivation of primarily red varietals including Cabernet Sauvignon, Merlot, Sangiovese, Cabernet Franc and Syrah potentially producing exceptional wines. This 2009 Murray Syrah is the third release of the estate vineyard Syrah. It is 100% from grapes grown on Red Mountain; two different clones of Syrah co-fermented with 5% Viognier. Tasting notes: The intensity of the vineyard is starting to show even in this young wine. The Syrah is dark red with a floral and brambly berry nose with a hint of tar and creosote. The palate is pleasingly plush, smooth with a continuation of the brambly berry fruit through the finish. With a production of about 5000 cases, Dominio IV is one of the smaller wineries in Oregon. Peter Lehmann Wines is one of Australia's most respected winemakers. The wines are made from grapes purchased from about 185 independent growers as well as grapes grown in the 4 company-owned vineyards. Many of Peter Lehmann Wines growers’ families have worked the same vineyards for five and, in some cases, six generations. Peter Lehmann Wines produces around 600,000 cases annually with distribution to Australia but also to the United Kingdom, the United States and other countries. Today, Peter Lehmann Wines is part of the Donald Hess family. The Barossa Valley in South Australia is one of the best wine-producing regions on Australia, around an hour from Adelaide. Tasting notes: This is such a classic taste of Barossa Shiraz, with lashings of chocolate and plum aromas and flavors. It’s a big mouthful of fruit with a firm and generous structure delivering all the comfort you’d expect from a Peter Lehmann wine. The Gault Millau WineGuide Deutschland 2013 includes 1080 winemakers of Germany, selected by the American-borne editor Joel B. Payne and his team. This is really the crème de la crème. The Gault Millau uses a scale of 1 to 5 Grapes. I have reported about the group of 10 winemakers who got in the 2013 Gault Millau WineGuide Deutschland the maximum number of 5 grapes. This posting provides a listing of those winemakers who got promoted in the Gault Millau WineGuide Deutschland 2013. The sixth annual EWBC Digital Wine Communications Conference will be held in Logroño (Spain) on October 25-27, 2013. The only international conference dedicated to the convergence of wine and the web, the EWBC - digital wine communications conference is a three-day event that provides a platform for the global wine community to address today's online communications opportunities. The 2013 conference is sponsored by the Consejo Regulador de la Denominación de Origen Calificada Rioja, and organized by Ryan and Gabriella Opaz and Robert McIntosh of social media company Vrazon in partnership with Catavino.net, a site dedicated to Iberian food and wine culture. 2013 sees the EWBC celebrating its sixth anniversary (previous events have been run in Spain, Portugal, Austria, Italy and Turkey) and an enthusiastic return to Rioja, scene of the very first conference, held in 2008. The conference will take place in and around the northern Spanish city of Logroño, and in other towns of the wine regions of Rioja and Alava, within easy travelling distance of many European locations. The theme of the 2013 conference is 'Flavour', reflecting the diversity of the world of wine, not just in terms of regions, grape varieties, wines and those who communicate about them, but also suggesting the multitude of shapes, forms and styles that the related communications can take. This will be my third EWBC; I participated in the 2010 conference in Vienna in Austria and in the 2011 conference in Brescia in Italy. I enjoyed these conferences very much. Here are my postings on schiller-wine. This time, I will be joined by Annette Schiller, founder and owner of Ombiasy Wine Tours. One oyster bar in the Washington DC area that has received quite some attention in recent weeks is the Rappahannock Oyster Bar at Union Market. It is the Washington DC outlet of a Virginia oyster producer - Rappahannock River Oysters - and only serves oysters it produces. The Chesapeake Bay – the largest estuary of the USA - used to be an area, where oysters would flourish. Virginia and Maryland combined to harvest 30 - in some years even 40 - million pounds oysters every year. But since the 1960s, oyster production in the Chesapeake Bay has collapsed to less than 1 percent of what it used to be. Efforts are underway to reverse this dire development. Virginia protects oysters with large sanctuaries in public waters but allows watermen to harvest them on a rotating basis about every two years. The state also strongly encourages private aquaculture, selling plots of riverbed or bay floor to oyster farmers. Maryland is only beginning to develop aquaculture. Rappahannock River Oysters – run and owned by Travis Croxton, who I met recently at the Chesapeake Bay and cousin Ryon Croxton - is among those innovative growers, who use aquaculture to produce quality oysters. Currently, their output reaches 4 million oysters per year. The origins of Rappahannock River Oysters can be traced all the way back to 1899. It was in that year that 24-year-old James Arthur Croxton, Jr., purchased five acres of leased river bottom in the Rappahannock River near Bowlers, Virginia. Union Market is a new artisanal food market in NE Washington DC with a long history. In 1931, Union Terminal Market opened at 4th Street and Florida Avenue NE, Washington DC. Meats, fish, dairy and produce were sold by approximately 700 vendors. In 1967, a new indoor market was built a few blocks away at 1309 5th Street NE, which is the current site of the revitalized Union Market. During the 1980s, many of the original merchants left the area and moved to modern distribution centers and supermarkets in the suburbs. Rappahannock Oyster Bar at Union Market is a 20-seat bar, flanked by a communal table and patio seating. The regular selection of raw oysters comprises the 3 kinds of oysters Rappahannock River Oysters grows: Rappahannocks, Stingrays and Olde Salts. Down the road, Travis Croxton anticipates offering “guest oysters” from elsewhere in the country. In addition, the menu includes steamed Olde Salt clams, oyster chowder with bacon, crab cakes, and grilled tuna loin with local peppers, tomatoes, and mojo de ajo. Travis Croxton says they plan to change the menu seasonally. Rappahannock Oyster Bar has a good wine selection; I had a nice Tarara Viognier from Virginia. On tap, we found DC Brau's The Corruption, Chocolate City Beer's Cornerstone Copper Ale, and 3 Stars Brewing Company's Southern Belle and Urban Farmhouse. There are also bottles of Flying Dog's Pearl Necklace Oyster Stout, which is brewed with Rappahannock's oysters. We tasted 3 kinds of oysters. Taste Profile: Deep cupped and mineral rich, with an understated saltiness that lets the oyster's natural flavor come though, our Rappahannocks offer up a sweet, buttery, full-bodied taste with a refreshingly clean, crisp finish. It's the very same oyster we started growing in 1899. Taste Profile: Drawn from the pristine waters of Mobjack Bay, Stingrays are the quintessential Chesapeake Bay oyster: sweet and mildly briny with a clean, crisp finish. Named after the Bay oyster's chief predator, these Stingrays bite back! Taste Profile: The truest taste of the ocean, our Olde Salt oyster brings together a bold sea-side brininess with a smooth, clean follow-through. Grown off the coast of Chincoteague (think Misty), our Olde Salt oyster is more than a classic, it’s a legend.